I watched her in Wonderful Life, Dragon Zakura, Rain Fall, Star no Koi, Boku Dake no Madonna and Oishii Puropozuu. Boku Dake no Madonna and Oishii Puropozuu are two very cliche doramas, but Hasegawa made both of them very enjoyable. It�Ls a pity that her character in Dragon Zakura is so useless :(. I liked her personality a lot in Boku Dake no Madonna but the one where she�Ls more cute is Wonderful Life, her haircut made her even more gorgeous. Besides being very beatiful she�Ls full of energy, i�Lve become a fan :). I first noticed her in Tentai Kanzoku (which she was not credited for on JDorama) and she GLOW! 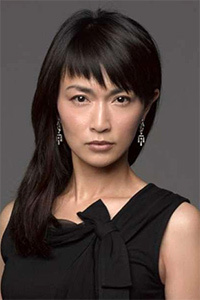 Even though the lead was Koyuki, Kyoko-san's supporting role really stood out with her beauty, poise and acting skills. Hope to see her in more god J-dramas, even as she remains one of the gorgeous faces of Kose. Since the first time I've seen her in star no koi, she had a small role but she captured my heart more than noriko fujiwara. and I knew back then that this chick has a bright future in front of her, currently the hottest j-chick around! but liked her with her black hair. She's so CUTE AND HOT at the same time. I love her smile and her acting in Boku Dake and Sutaa are just right! She's got a great acting atmosphere and her characters are loveable. I LOVE HER! Keeps getting prettier and prettier. Started off as a complementary actress playing bit parts, but has really blossomed in 'Boku dake no Madonna'. WE NEED MORE VOTES FOR KYOKO! She's really awesome in Dragon Zakura and Boku Dake No Madonna. I like her when she's playing the English teacher, her shyness is cute and she's hot when she speaks English. I like her because I've liked her since her modelling days many years back before she was even well-known as an actress. Surprised to later see her on dorama. You see her in likeable roles such as Wonderful Life and Boku dake no Madonna. Beautiful and a good actress. I never thought she was that pretty in itsumo futari de.. but she looks really pretty now. Also talented as well. The picture of feminine beauty. Wearing that red evening dress in Oishii Puropozu, this is what women were made to look like! She's one actress who has made me lost for words. I have to admit, she's beautiful!!! Especially in Boku dake no madonna. She's so charming and beautiful in Boku Dake no Madonna... She has something special, her characters speaks for myself! She's a beautiful and talented actress. I think she's pretty... the prettiest in the girls in Japanese drama I have seen... She's a heartbreaker! She's a very attractive young actress, and a great talent I hope to see more of in upcoming dorama's. I didn't like her at first, but her acting has surpassed my expectations especially in M no Higeki.. I love her performance in Boku dake no madonna. She is very beautiful and her acting also good. She so pretty! I like her in "searching for my polestar" . I think she play the role very well! Gorgeous and great acting, especially in Boku Dake no Madonna, has a very 'versatile' image.